Tech customers can get bad repairs fixed with this computer complaint letter. 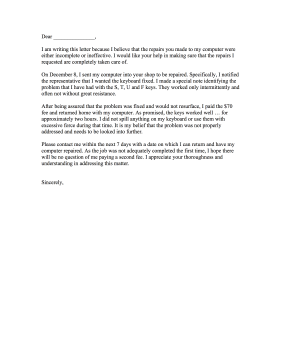 I am writing this letter because I believe that the repairs you made to my computer were either incomplete or ineffective. I would like your help in making sure that the repairs I requested are completely taken care of. On December 8, I sent my computer into your shop to be repaired. Specifically, I notified the representative that I wanted the keyboard fixed. I made a special note identifying the problem that I have had with the S, T, U and F keys. They worked only intermittently and often not without great resistance. After being assured that the problem was fixed and would not resurface, I paid the $70 fee and returned home with my computer. As promised, the keys worked well…for approximately two hours. I did not spill anything on my keyboard or use them with excessive force during that time. It is my belief that the problem was not properly addressed and needs to be looked into further. Please contact me within the next 7 days with a date on which I can return and have my computer repaired. As the job was not adequately completed the first time, I hope there will be no question of me paying a second fee. I appreciate your thoroughness and understanding in addressing this matter.